Children can use this indicator to tell you how they are feeling. 1. Gather your material. 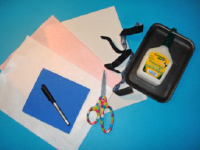 You will need light pink felt, white felt, white Fun Foam, a scrap of blue Fun Foam, white glue, a Styrofoam platter, scissors, a marker, and Velcro. 2. Trace the child's hand and wrist on the white Fun Foam and cut it out. 3. 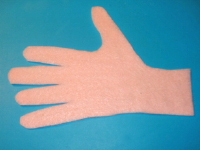 Glue the Fun Foam model on the light pink felt. Cut around it. 4. 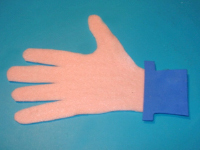 Cut a shirt cuff out of the blue Fun Foam and glue it over the wrist (on the felt hand). 5. 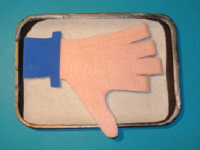 As shown, turn the hand over and fold the four fingers, but not the thumb. Glue the fingers in this position. 6. 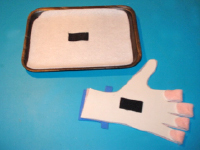 Cut a white felt rectangle that is the same size as the inside of the Styrofoam platter. Glue it in place. Stick a piece of male Velcro in the centre of the platter, on the white felt. 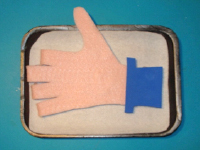 Glue a piece of female Velcro under the hand. 7. 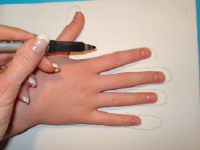 The child can stick the hand on the board with the thumb pointing down to indicate that he is sad or angry. 8. 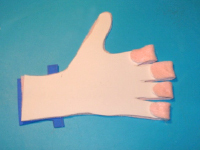 He can position the hand with the thumb pointing up to indicate he is happy or comfortable in a situation. I hope you will see a lot of thumbs up!